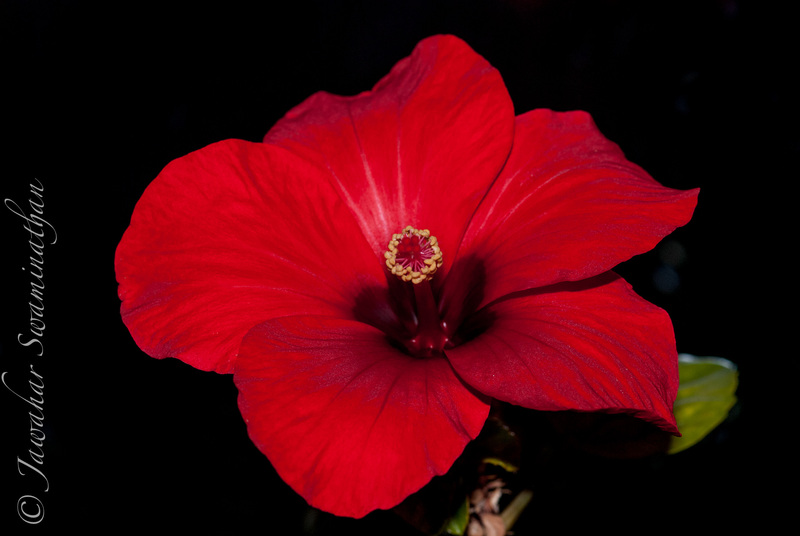 Hibiscus is a great flower to photograph. 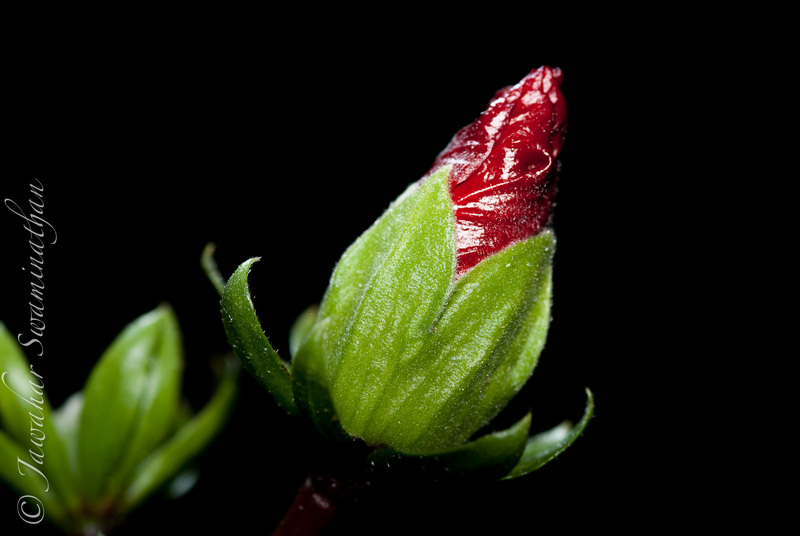 The contrast between the green sepals and bracts, showy red petals (this particular variety), deep red pistils surrounded by bright yellow stamens make a great study in contrast especially against a dark background. 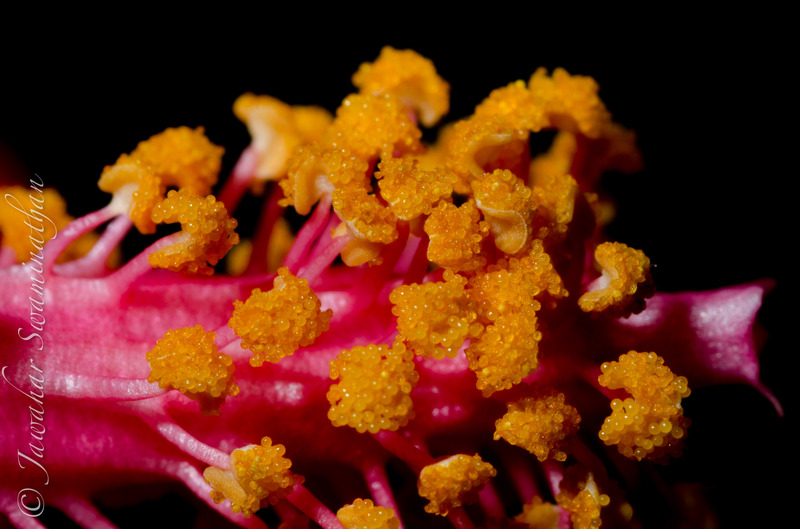 You may not enjoy the botany below, but I’m sure you’ll agree that nature truly offers a marvelous spectacle in the microscopic. Click on any picture to see a larger version!! 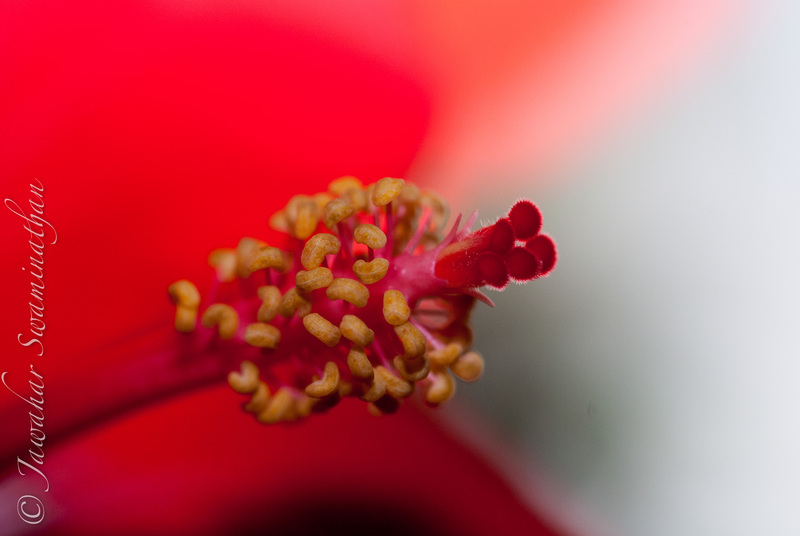 Close-up of the reproductive organs of a Hibiscus flower. 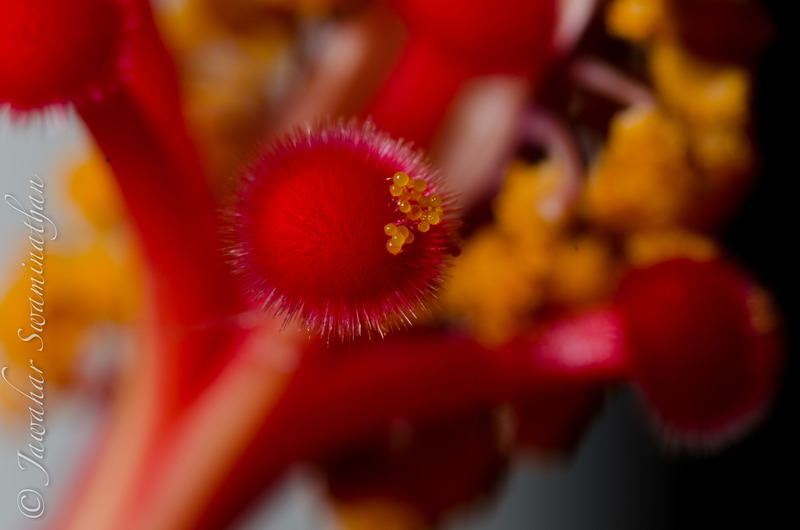 The yellow stamens and the red pistils. Stamen – that make up the male reproductive parts – in turn made up of the filament that holds up the pollen sac or anther. The anther releases pollen when open. 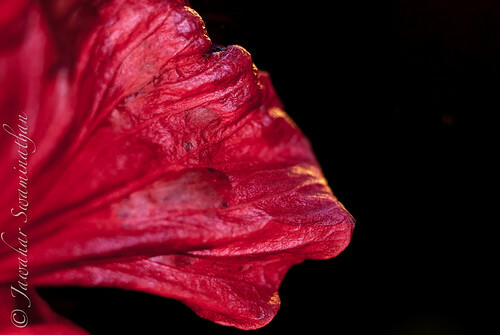 Detail of a Hibiscus flower stamen. Even closer. 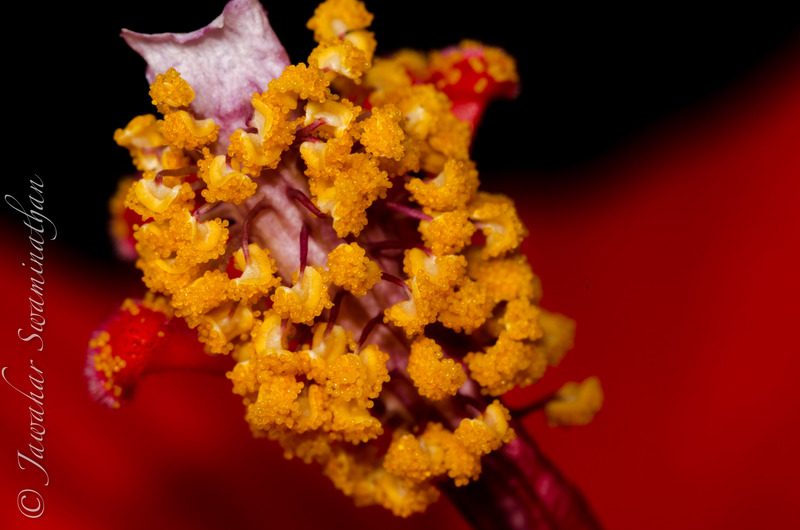 Glittering Hibiscus pollen on anthers held up by the filament – forming the stamen of the Hibiscus flower. Stigma – the farthest extend of the female part of the flower which receives the pollen for fertilization. This is usually sticky and allows pollen to attach. 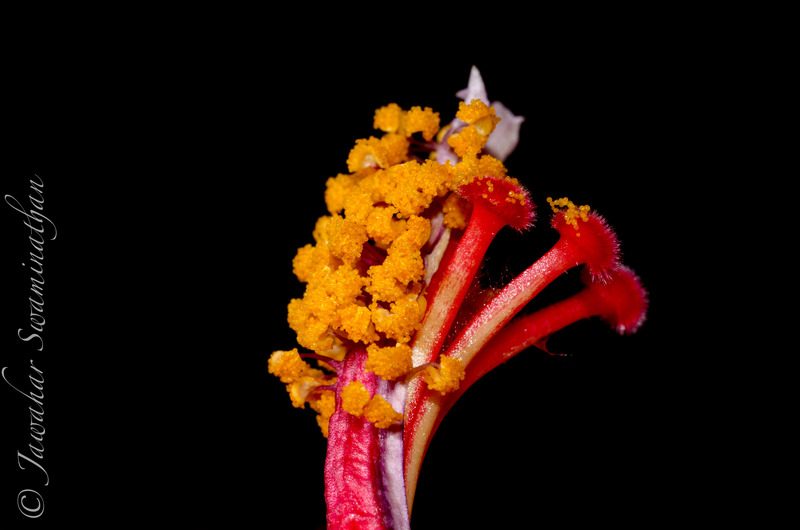 The stigma of a Hibiscus flower, with pollen on them. The pollen in the above picture look spherical, don’t they? But in the picture below, which is a crop of the above, you can see that the pollen grains are spiky, thereby allowing them to stick to the stigma surface. 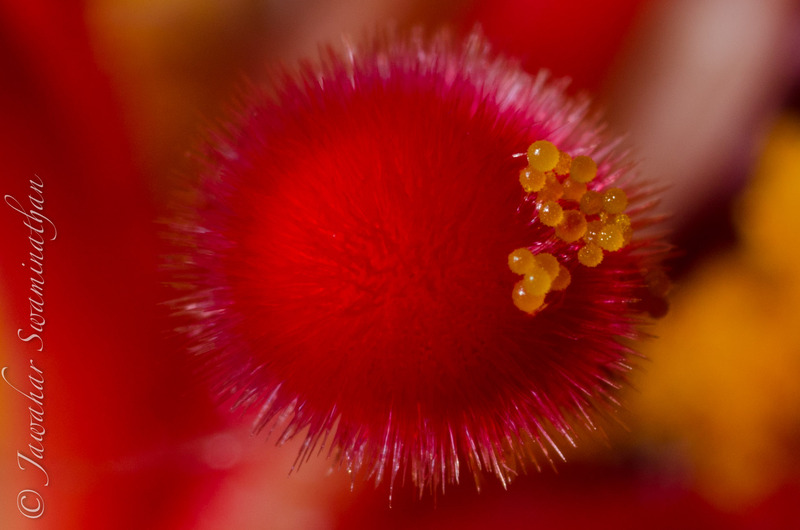 100% crop of a stigma showing the real structure of pollen. Well, that’s my botany lesson! 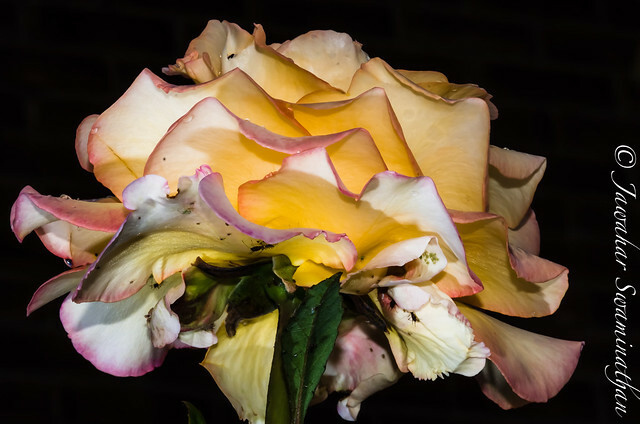 Thanks for stopping by…. 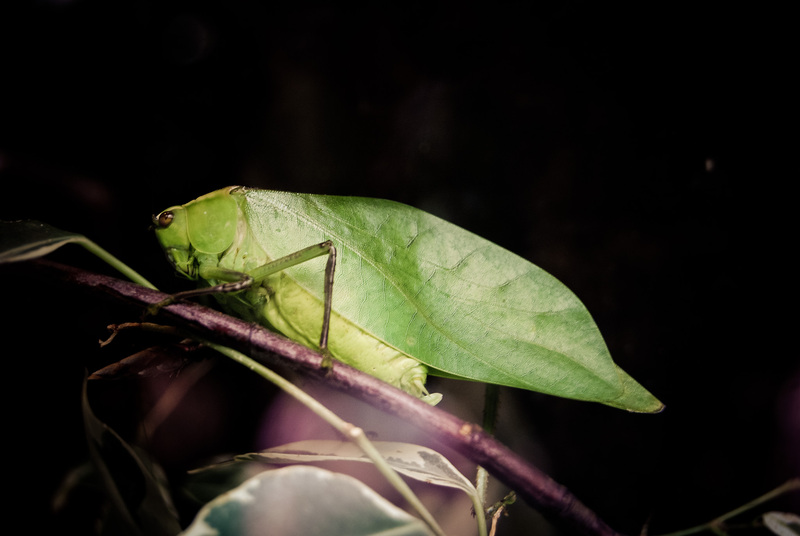 Sigma 105mm, f/2.8 macro lens (with extension tubes for the closeups). A friend of mine recently went on a Reiki course and now swears by this spiritual technique that can apparently solve all ills of the body, mind and soul by channelling and transference of universal spiritual energy through touch. Sounds incredible, doesn’t it? As a scientist and a rational thinker I was curious to know more about this branch of spiritual medicine (if I may be allowed to call it so!). This is what I have learnt/understood from reading. Caution: Reiki practitioners and believers may find this deeply upsetting. There is no belief system attached to Reiki so anyone can receive or learn to give a Reiki treatment, the only prerequisite is the want to be healed. It is possible to heal at any level of being: physical, mental, emotional or spiritual. In order to be cured, you should really want to be cured. Sceptics such as myself will not be healed because we look at the technique dispassionately. I have concerns with the statement that any level of ailment can be cured or helped by Reiki. This must be the magnet for attracting all those people who have chronic illnesses, and are in a position where they are willing to take anything that offers even a glimmer of hope of improvement!! As such, it sounds brilliant – you go and lie down somewhere for an hour or more, someone places their palms on your body at various places and you get up and feel an improvement. Wow!! Maybe NHS (here in the UK) and doctors around the world trying to find cures for various chronic disorders should just become Reiki practitioners. Of course, I will still not be cured as I will always activate the escape clause (want to be healed one!). The Reiki practitioners are careful to say that rapidly progressing disorders like cancers and terminal illnesses cannot be reversed since the time for treatment is less, but they offer to reduce your pain and discomfort as you lie dying. Well ok! I could accept that in cases of terminal illnesses, anything that alleviates pain, even if it be Reiki is acceptable (if it works, that is!). “the evidence is insufficient to suggest that Reiki is an effective treatment for any condition. Therefore the value of Reiki remains unproven.” (Link to Article). 2011: The Effects of Reiki Therapy on Pain and Anxiety in Patients Attending a Day Oncology and Infusion Services Unit. (PubMed Link). And for those of us who think placebo effect, this study showed otherwise. 2011: Immediate effects of Reiki on heart rate variability, cortisol levels, and body temperature in health care professionals with burnout. (PubMed Link). So the jury is out on Reiki, and like many other things in this world, people who believe will continue to believe and those like me who are sceptical will continue to remain so. It may turn out in the end that Reiki appears to be effective because people want it to work, like Homoeopathy! And there is peer-pressure to show that it worked. After all, if it did not work for you, the argument could be made that you did not really want to be cured. There is no winning this argument, is there? But to trust in Reiki like therapies at the cost of modern medicine for life-affecting diseases would be a stupid thing to do. I’d probably consider using Reiki if I had back pain or something similar to complement physiotherapy, but not as a treatment for pneumonia or bird flu!